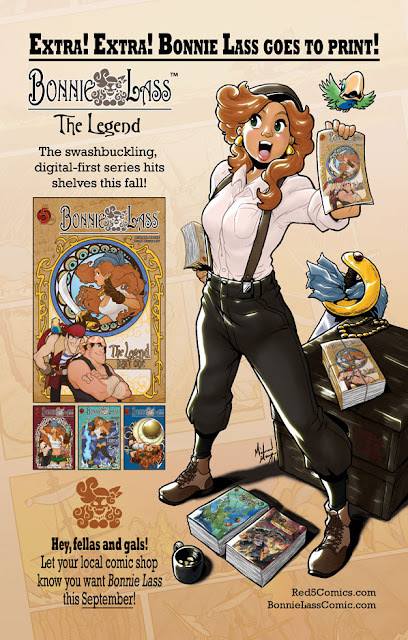 "Bonnie Lass" Invades Comic Shops in September! Red 5 Comics announces the start of pre-orders for its latest comic title coming to print — the high-energy joy-filled “Bonnie Lass: The Legend” from creators Michael Mayne and Tyler Fluharty. Earlier this year, “Bonnie Lass” was the premiere title of the “Red 5 Comics Digital First” line of comics that would debut on the web and mobile devices. This would serve as a testing ground for off-beat, off-genre or new-talent titles looking to build a following, buzz and track-record up-front to set-up a big splash in print. “Bonnie Lass” spins the yarn of a brash and daring young pirate heroine in a world that mashes the familiar motifs of legendary sea-faring pirates with the tone of an American western and a dash of modern-day technology like automobiles and GPS. Filled with daddy-issues toward her infamous pirate father, Bonnie is after the one treasure he did not claim. More importantly, “Bonnie Lass” also earned the paid following of digital comic readers on the comiXology and iVerse reader platforms, garnering sales comparable to hard-copy favorites like “Atomic Robo”, “Neozoic” and “Abyss” — but without the benefit of a print release promotion. As Red 5 is an independent publisher, your comic shop may not carry “Bonnie Lass” this fall unless you pre-order your copy during the month of July using order code JUL111217. “Bonnie Lass #1” of the four-issue series is a spotlight item in July’s Diamond Preview catalog and set for release on September 21, 2011 for just $2.99.